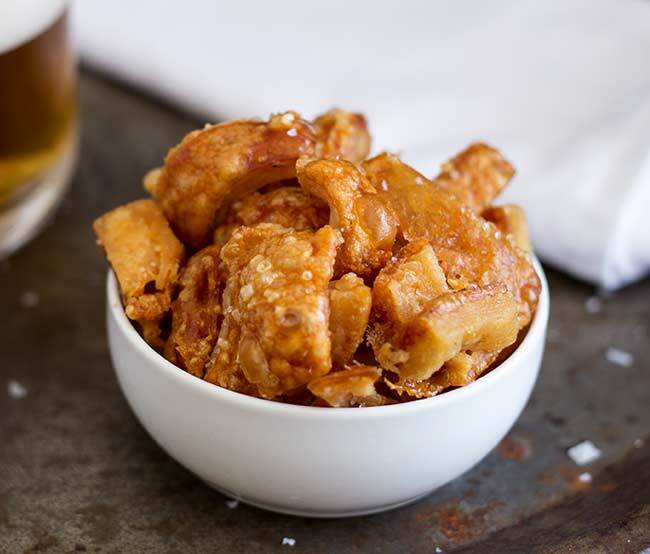 These Crispy Crackling Bites are the perfect game day snack. These are salty crispy bites of amazingness! They are essentially homemade pork scratching, so packed with porky salty flavors. Plus they are naturally gluten free and perfect for the Keto diet. The game is almost over, there are friends on every chair and sofa and the air is tight. This is the deciding game and everyone has an opinion on the team and tactics. To say the atmosphere is tense is an understatement. At times you could hear a pin drop and at others there are deafening roars as everyone projects their opinions towards the screen. As final time is called there are some differences of opinion flying around the room. 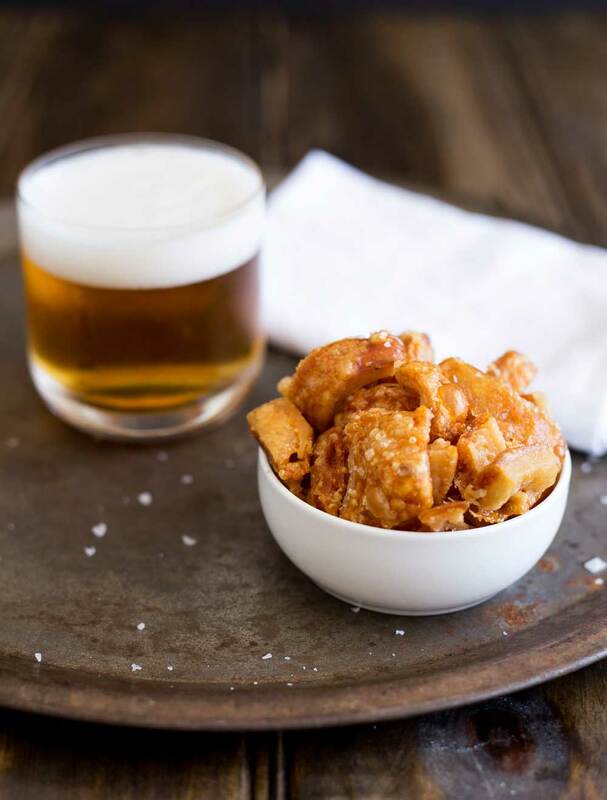 You decide to calm the air, a bowl of crackling bites and bottles of beer…..a group of friends laughing. Celebrating and commiserating, all united over pork and beer! These porky salty bites! Seriously you are going to LOVE them!!!! And they are perfect for serving to friends. 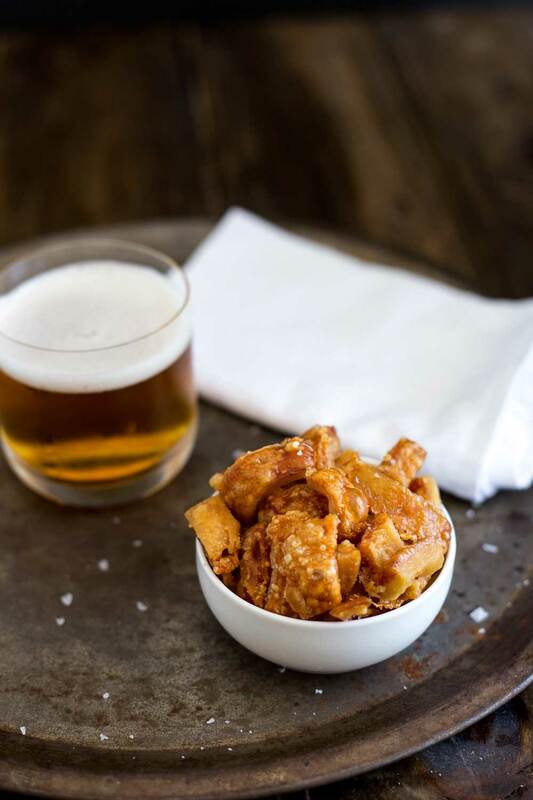 Imagine the faces of all your friends when you serve up what is really the best bit of roast pork 😉 Pour a nice glass of beer or cider and dig in to these crispy crackling bites. 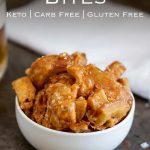 They are so simple to make and being carb free, they are great for those on the Keto, paleo or Atkins diet. How do you make Pork Scratchings at home? The beautiful part about these is they take a cheap ingredient and turn it into something that is so moorish that you may have to monitor the bowl so no fights break out…..the last piece of crackling is a valuable thing! If you have cut the rind off a joint to put in the slow cooker, then this is a way to use that up. Or you can buy pork rind in the supermarket. It usually comes rolled up and is about $3 a kilo! It is such good value! I take an unconventional step and poach my rind first. I find this removes some of the fat, which once they are roasted helps them to keep their crunch and makes them easier to crisp up in the oven…..Well it does as long as you dry the bites really well after poaching, then you can still get perfect crackly bites. For another game day snack why not try these Pizza Bagel Bites from my friend Kelly over at The Anthony Kitchen. They are a homemade version of a childhood classic. Cut the pork rind into 20-25 bite sized pieces. Place the water in a saucepan and add the pork rinds. If they are not covered add more boiling water to ensure they are all covered. Bring the water back to a boil, then turn the heat down to low and cook the rind for 15-20 minutes. Drain the rind and tip it onto cooking paper. Pat it until it is super super dry. Place it to one side. At this point you can refrigerate it until you want to make your bites. Keep it uncovered in the fridge to help it to dry out. Line a baking sheet with some cooking paper and lay the pork rind pieces out in a single layer. Roast in the middle of the oven for 20 minutes, then flip all the pieces and roast for a further 10 minutes. Check your rind to ensure all the pieces are crispy. Often I find there are a few that still have a bit of softness to them. So I will remove the crispy ones and leave the softer ones in for a further 5-10 minutes. Remove the bites from the oven and drain on more cooking paper. Sprinkle with sea salt to serve. I usually serve these once they have cooled. But they are great straight from the oven. If you aren't worried about the carbs you can poach these in apple juice. 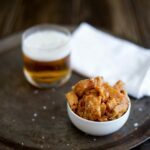 If you love food why not subscribe to my newsletter, I will drop you an email every now and then, just to say hi and send you a couple of recipes think you might love, like these Crispy Crackling Bites. This recipe looks so good! I saw a huge version of this at a Latino grocery in California. You could have made a pizza on it! I will be dreaming of these all day today. Love this kind of stuff and I didn’t realize it was so easy to make!! Love it Claire! Sending this to my keto friends, they’re going to flip over this crazy easy recipe! Thank you Jenn, isn’t it just the best!!! Love the saltiness and crunchy texture of this snack recipe! So good! Thank you Amanda, it is a bit of an addictive snack isn’t it! Where have those been all my life?! awesome idea! Love the texture of these cracklin’s! Salty snacks are my favorite for viewing parties. These sound fun and tasty! Make sure you have plenty of these in from 11 January! I must write stuff down!!! I thought you arrived on the 9th! Whenever I’m in the UK I always treat myself to a packet of pork crackling from M&S. We always fight over the crackling when I do a roast – it’s the best bit isn’t it?